PONY RYDER: Yannis, your agency has produced many top names in the industry! 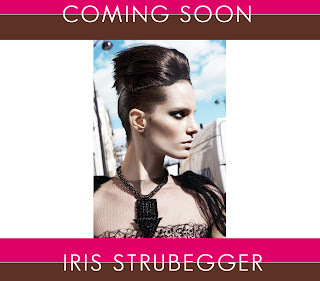 Iris is one of your top discoveries and is one of the most sought-after models at the moment, with no sign of stopping! YANNIS NIKOLAOU: After many years in this business Jan Eric and I always ask our new faces to trust our tips and knowledge. Many models think that they know better, after a short time doing this job. They only speak with other models. They don't know how the clients are, because they meet them briefly, while they are on jobs with them, or just for a few minutes when they have a casting. Just looking good brings no success anymore. There are hundreds, thousands of us - so many models and agencies. Today it is very difficult to get a second chance, as every season new models are coming, and after them, new models are waiting to come. If you are 17 or 20, you never know better than your agent, and you never will. My experience is that the models who had trust in what I advised them to do and tried to follow all my tips, all had success, more or less. Iris is one of the models who was always listening to me and she was just doing what we agreed on: hair like this, brows like this, clothes like this… Now New York, now Paris.. This shooting yes, this shooting no... this agency in Paris, this one in New York. She never asked why we chose this agency in New York and not the other one. There are always reasons why a model is with agency A and not agency B: maybe agency B does not want this certain model, maybe we, as agency, do not work with agency B. Many models come with the question: "Why is Iris with Supreme and I am not... I also want to be with Supreme…“ They think that only because Iris is successful with Supreme, everybody will be... But no, it’s not like that. We had and still have models that a lot of international agencies had no interest in representing, but we keep them and we try further, because we believe in their potential. We never stopped, even for a second, believing in the potential Iris has. The time that she has stopped, we still had a friendly contact all the time. There were a lot of people who told me that Iris was to old to start. But how old are Kate Moss, Naomi, Giselle, Amber, Linda..? And all the other girls who work a lot.. are they 16,17? They are not, they are older. Because they have personality and are not empty dolls. Yes, maybe some girls are 16 and look amazing, but are they full time models? Does a 16 year old Dutch or French or German girl live in New York…without going to school, away from her family? No. In most A list campaigns, how old are the girls? Not 17! Iris had the experience from before and the personality, which you develop by getting mature. Iris could do much more, make it to the very top, but for that she is too nice and too honest. Clients love how professional she is, very hard working, always polite. And we love her for all of this and because she became a friend. Iris is family and for your family you do everything. Of course we are happy that she is doing so great but we are more proud that she did not change at all, and still is down to earth, the same person that I have in my mind from the first day we met.